Fr. Francis Vu Tran, an American SCJ originally from Vietnam, was the community’s first SCJ pastor. Fr. Francis is now superior of the District of Vietnam and Fr. 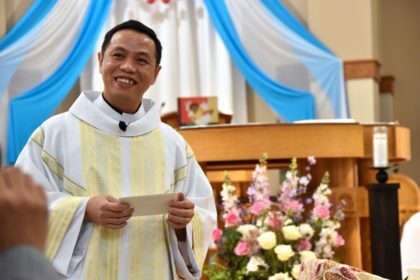 Joseph Quang Tran, SCJ, a member of the district, is the current pastor to the Vietnamese community in Milwaukee, as well as associate pastor of St. Martin of Tours. Other SCJs who have served the Vietnamese community include Fr. Thi Pham and Fr. Joseph Dinh. Fr. Terry Langley, SCJ, is pastor of St. Martin of Tours. The Vietnamese worship community is not a separate parish within St. Martin of Tours. There are special Vietnamese celebrations and cultural activities, such as Tet (Vietnamese New Year) but they are events hosted by the full parish and welcome to all parishioners. Several SCJs took part in the anniversary Mass, including two former pastors: Fr. Anthony Russo, SCJ and Fr. Yvon Sheehy, SCJ (concelebrants are pictured at the top of the page). And at the end of the Mass a birthday cake with “40” in candles on the top was wheeled out. But it wasn’t in honor of the Vietnamese community, it was for their pastor, Fr. Joseph Quang Tran, who turns 40 himself on October 9. Click here to view photos; they are also posted on the Province Facebook page. Canadian SCJs at their assembly last week. 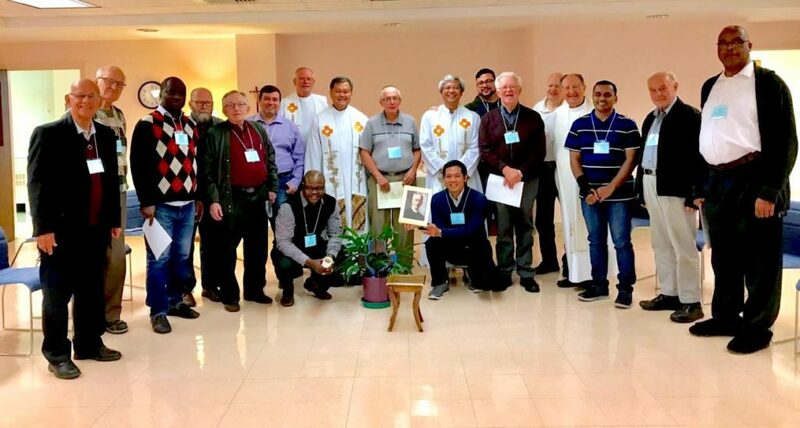 The Canadian Region held its annual assembly October 1-3 at the Providence Spirituality Centre in Kingston, ON. Coming to the end of an administrative term, much of the focus of the assembly was on taking a look at the current picture of the region. It is an entity with many new faces, faces from around the world. Read more on the DehonCanada website. Fr. Walter Van As, SCJ, a member of the Montréal community, died October 6. At 95, Fr. Walter was the eldest SCJ in North America. He was professed 74 years and ordained 68. Originally from the Netherlands, Fr. 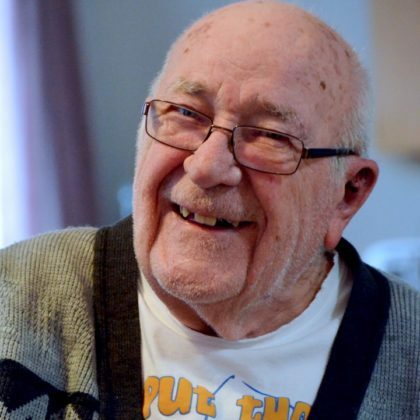 Walter ministered for many years in parishes in Quebec. Visitation will be at Maison Funéraire Desforges, 188 Main St., Grenville (Quebec), J0V 1J0, on Wednesday, October 10, from 2-5:00 p.m. and from 7-9:00 p.m., and on Thursday, October 11, at 9:00 a.m. The Mass of Christian Burial will be at 11:00 a.m. at Grenville Church (322 Main St., Grenville, J0V 1J0); burial will be at the local cemetery, followed by a light lunch at the Centre Communautaire (21 Tri-Jean St., Grenville, J0V 1J0). The email version of the Fridge Notes (weekly news) looks a little different this week. The new format should allow for better viewing on mobile devices. If you prefer to view the Fridge Notes on the website, you can do so from the “NEWS” link at the top of any page within the province website, or by scrolling down slightly on the homepage until the Fridge Notes box is visible on the left, below the banner image on the page. If you are reading this, you are viewing the Fridge Notes on the website. In the previous Fridge Notes email layout, there was a list of calendar items in the right column. Now, you can access the North American Google Calendar from a button at the bottom of the Fridge Notes email. The calendar lists birthdays of SCJs and Dehonian students in North America, as well as province and regional events. Click here to suggest additions to the calendar. On the website, the calendar is accessible from the bottom of any page within the site. Just click on the Google calendar icon. The email version of Fridge Notes is sent most Mondays. Click here to subscribe. It is sent from the following email address: comdir@scjcommunications.org. Make sure that address is in your list of contacts so that you can receive it. An historical exhibit put together by the Province Archives for the 2018 Province Chapter and Province Assembly was featured in the October 2018 edition of the Midwest Archives Conference newsletter. The display commemorated the Dehonians’ many years of ministry in the United States. Fr. Wayne Jenkins, SCJ, is archivist, and Fr. Ed Zemlik, SCJ, is associate archivist. “When we all work together, we become a beautiful example of the Church’s community in its diversity and unity,” said Fr. Tomasz Flak, SCJ, during his homily at last week’s multicultural Mass at Sacred Heart Seminary and School of Theology. The Mass highlighted many of the cultures and languages represented in the ESL program. Read Fr. 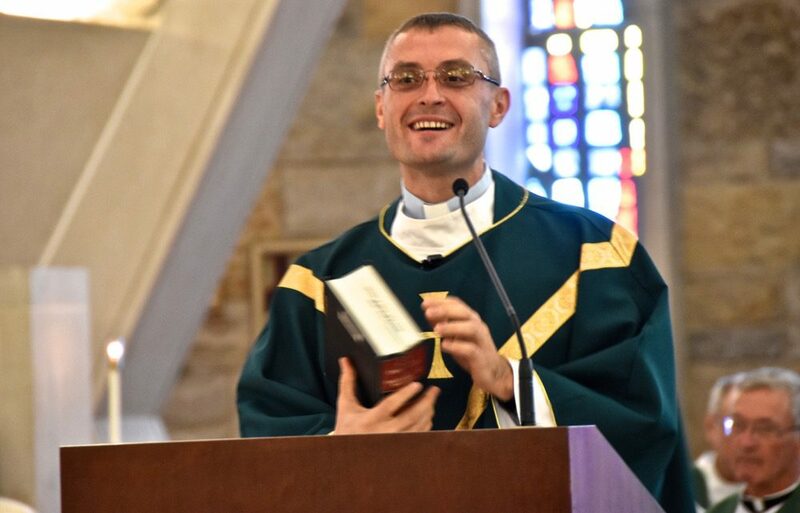 Tomasz’ full homily on the province blog. Follow the SHSST and US Province Facebook pages for news and photos from the symposium. 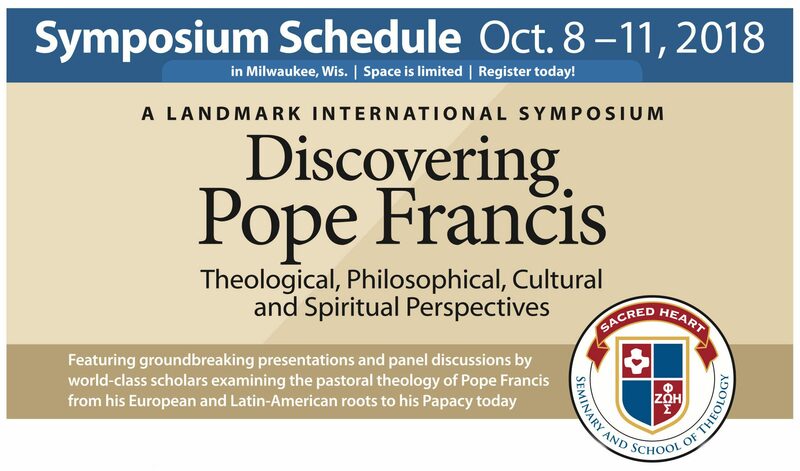 It concludes on Thursday with closing prayer led by Archbishop Christophe Pierre, Apostolic Nuncio to the United States. Click here to get the Fridge Notes (weekly news) news delivered to your e-mail box!